Chapter 13 – What a Course! by Edward E. Smith, Ph.D.
Chapter 2 – The Emigrants by David H. Keller, M.D. Robot Nemesis by E.E. Smith, Ph.D.
COSMOS – David H. Keller, M.D. April, 1934 – The best chapter? 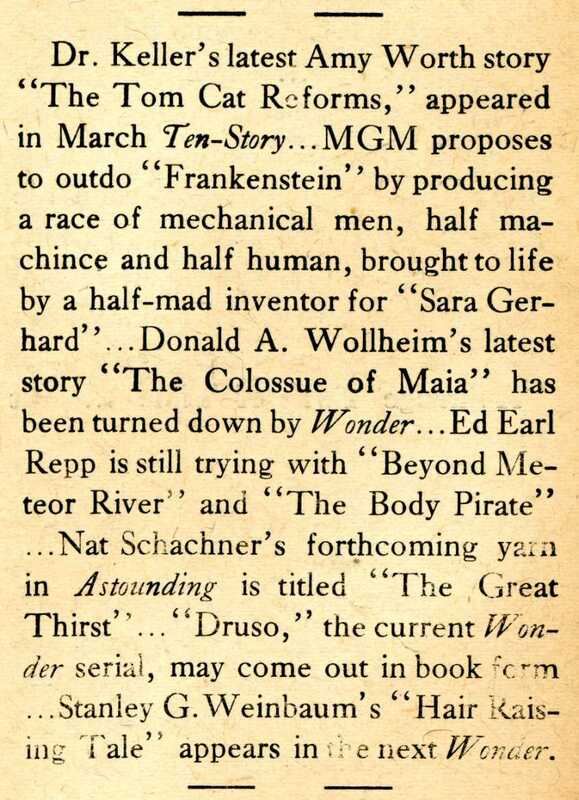 March, 1934 – What’s up with the printer? Who am I, and why am I doing this? Not only have these good comrades contributed material, but they have contributed financially toward our upkeep. Today the Company is entirely free of debt, the losses incurred in starting have been wiped out, and we have enough paper and material on hand to operate for many many months to come. But unfortunately this organization has one cog which cannot function as it did. Lately I have been fortunate in securing a number of good printing contracts which now occupy a large portion of my time. Therefore our May issue was late, our June issue is late, and our July and August issues will also be late. Until September we can keep going on a monthly basis, but after September we may have to skip an issue every now and then because of the pressure of other work which keeps me busy. It is unfortunate that my personal good fortune in an increased business should mean that the magazine must come out less frequency. But I must earn my living in this world. Much as I would prefer to devote my entire time to publication of Fantasy, I must hereafter allot it only that portion of my time not taken up by profitable business. And thus we are in the most crucial period of our existence. There is no reason why Fantasy should be entirely abandoned, for, as I have explained, our Company is in the most solid of financial conditions. But our income does not justify nor permit paying for the work of having Fantasy printed. Therefore, I make this appeal to each and every reader of Fantasy, to each and every fantasy fan who may read this: Stand by us, help us to get new subscriptions, more advertising, new sources of revenue. Help us with every means in your power, for upon you depends whether Fantasy should be printed monthly or not. If our income increases sufficiently so that we can hire a helper to print Fantasy, it will appear monthly. Until then, I can only continue to print Fantasy as I find the extra time from my paying work. I resign as editor, and in my place steps a better man, a man more capable of carrying on the editorial policies – Julius Schwartz…. I guess there isn’t much left for me to say regarding Fantasy’s position. It is clear that the future fate of FM rests entirely with you readers. Help us secure more subscriptions and more advertising and you will be doing your share. It is unfortunate that our July and August issues must of necessity contain only 16 pages each besides the COSMOS supplements. We know you’d rather have two 16 page summer issues complete with last minute news, than one regular 32 page summer issue with stale news. I assure you, the July and August issues will be very compact and the loss of 16 pages won’t be felt because no fiction will appear. In the July issue there will be six pages of last minute scientifiction and scientifilm news and gossip, an interview with Laurence Manning, the remainder of the Cigarette Characterizations, a feature I am sure has proven a hit with everyone, and other interesting articles dealing with various phases of fantastic fiction. 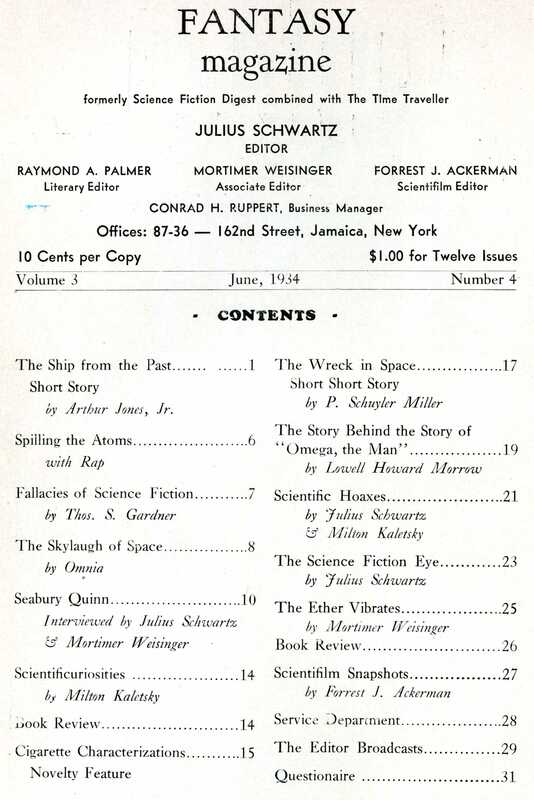 And the installment of COSMOS is by Edward E. “Skylark” Smith! As dedicated as the staff of FM was, the magazine didn’t pay their bills. It was a volunteer effort driven by their passion. It’s interesting to note Ruppert’s statement that “the depression is over” – in fact, difficult economic times continued in the US until 1940. Resilience and optimism were essential ingredients in sustaining such a venture. 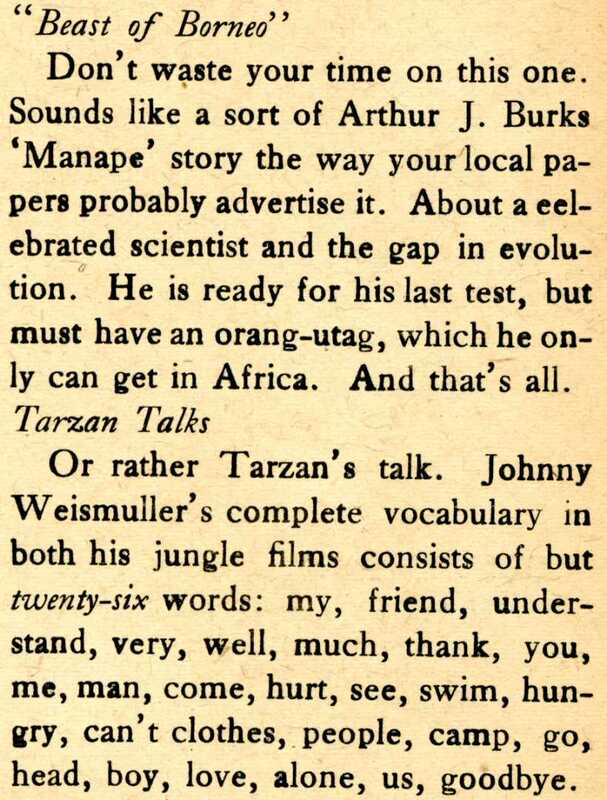 For many readers, the core value of Fantasy Magazine remained the news and reviews columns. The lively, humorous pieces by Ackerman (“Scientifilm Snapshots,” on the left) and Schwartz (“The Science Fiction Eye,” on the right) brought a sense of being on the inside of the rapidly-evolving genre. Read Chapter 12 of Cosmos. Read about the July, 1934 issue.